In the midst of the ominous message that we are careening toward destruction, there are signs of hope everywhere in acts large and small that people are taking to mitigate the effects of climate change and restore damaged lands. 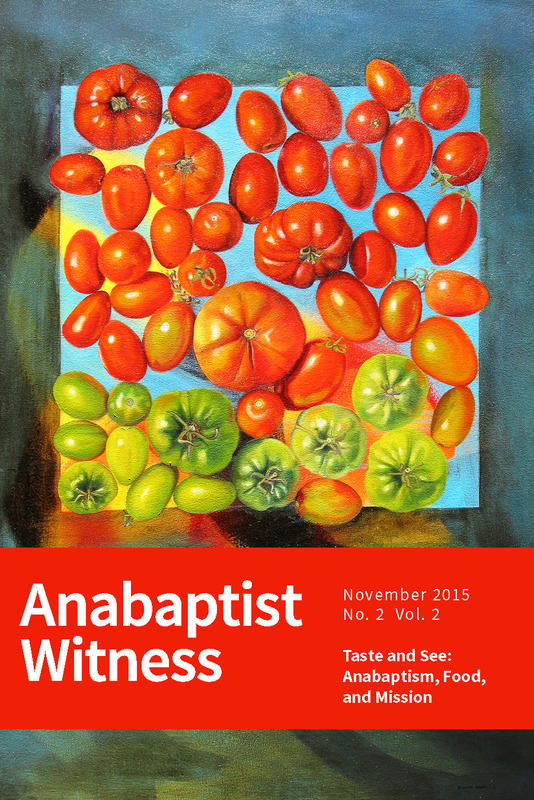 Essays in this issue of Anabaptist Witness explore and propose some of these hopeful acts: community gardens in the Netherlands and Syria, environmental activism in the UK, the carbon impact of mission agency travel, and imaginative speech about God and the environment shaped by dialogue with indigenous communities and embracing "wildness" in one's soul. Mission partnerships must address historical sins, financial limitations, and theological differences. In spite of the difficulties, we remain drawn into partnerships by friendship and mutual need, by overlapping history and vision, and, ultimately, by the Holy Spirit. Partnerships are difficult—but how good and pleasant it is to dwell in unity (Ps 133:1)! 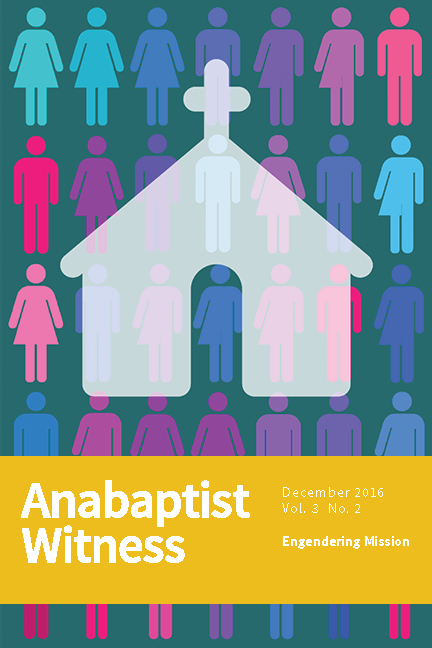 This issue of Anabaptist Witness collects papers on global mission partnerships from the 2018 Council of International Anabaptist Ministries Plenary, as well as a selection of additional articles on the theme. 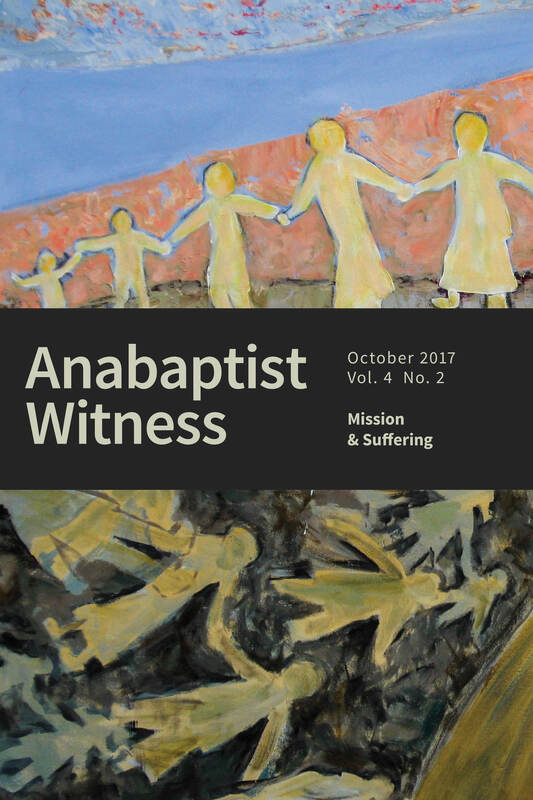 The contributors to this issue of Anabaptist Witness have strained to see God amid experiences of suffering in mission, and in doing so they point to the hope of resurrection life. Articles, poems, and artwork address missionary suffering, mission that responds to suffering, and mission that causes suffering. Specific topics treated include Ausbund hymns, Sufi Islam, health crisis during ministry, marginalized indigenous communities in southern Mexico, and Mennonite participation in the Canadian Residential Schools program for indigenous children. How have Anabaptists and Mennonites followed the Spirit in mission? How might we follow the Holy Spirit in mission? 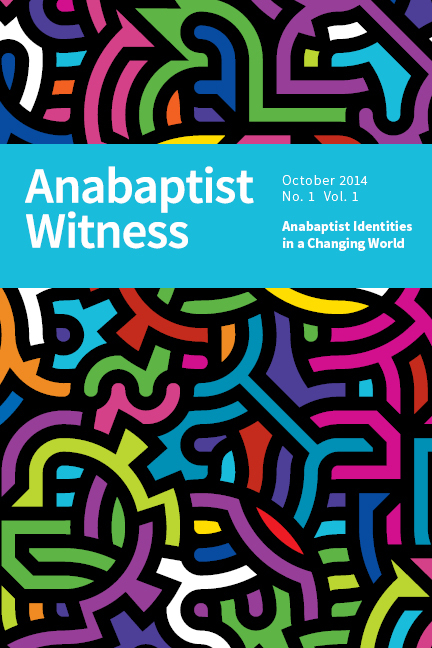 Articles in this issue address these question through examination of Anabaptism and the Pentecostal-Charismatic movement; early charismatic expressions among Russian Mennonite Brethren; Spirit-empowered witness and the church in South Africa; Anabaptist inspiration for the church in postmodern Britain; and the story of the Meserete Kristos Church in Ethiopia. The issue also features poetry and book reviews. Through strategy, organization, and subversion, women have proven time and again that the Holy Spirit gifts individuals, regardless of gender, with the power to teach, preach, and minister to others. In this issue you will find stories of courageous individuals determined to share the gospel. Their legacies and the challenges they put forth provide us with much to draw on as we consider gender in our changing contexts, and what it means to bear the good news. What is Christian mission? Is it verbally sharing the gospel in order to convert non-believers? Is it social justice ministry aimed at realizing God's shalom on earth as it is in heaven? Is it some mixture of both, or something else entirely? 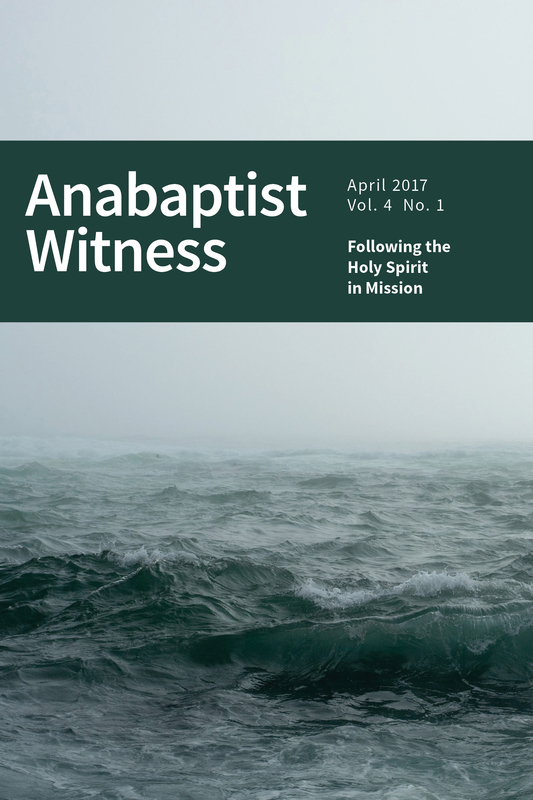 Contributors to the current issue of Anabaptist Witness engage these crucial questions through theological, biblical, and personal reflections on ministry in a wide variety of settings. While most contributors agree that mission involves all of life, disagreements are evident over the specific shape of mission practice. Still, there seems to be an emerging consensus that mission involves vulnerable encounters with others. We hope that this issue will help you answer the question, What is mission? In the beginning God created. This chef of all things cooked up a feast of earth, plants that grow fruit, and beings to enjoy and care for this abundance. And God called these creations good. We are the custodians of this good earth. Every meal we eat we are connected with those who dreamed up the recipes, nurtured the soil, picked and washed and shipped the goods, and sold the ingredients to us in our markets and stores. From the bread we break at the Lord’s Supper, to the potlucks we share and the cookbooks we produce, our interaction with food connects us with our creator and sustainer, and to individuals living around the world. 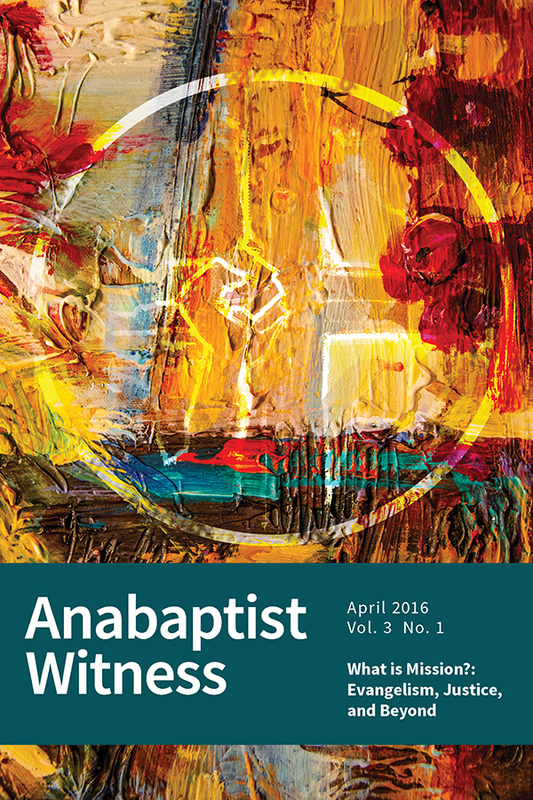 Taste and see what God is up to around the world by engaging this latest issue of Anabaptist Witness, which includes original poetry, calligraphy, paintings, reflections and more. 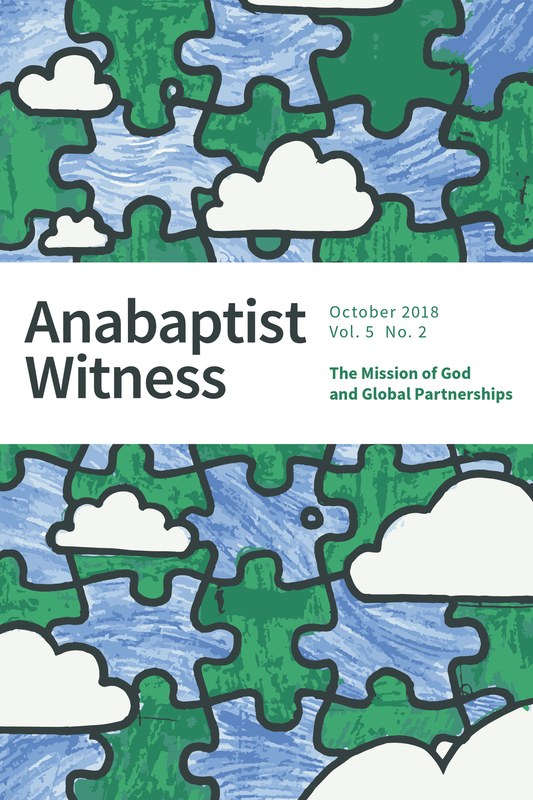 Consideration of the church's missional constitution and context lead to the claim that interaction with religious others is a necessary element of Anabaptist witness. But what does this interaction look like? What should it look like? What resources do Christian theology and missiology offer as guides to understanding and engaging other religions? 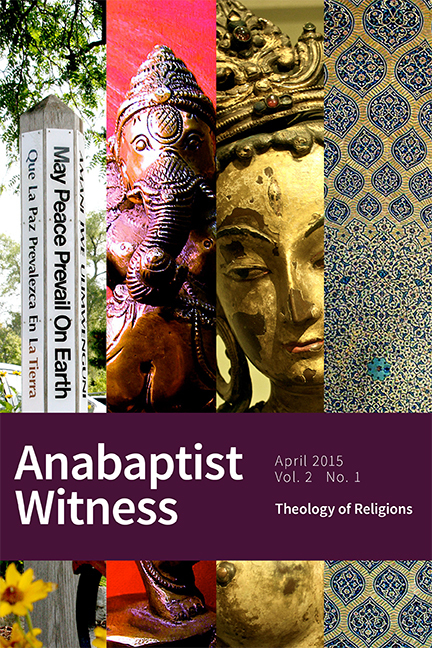 The essays in this issue of Anabaptist Witness offer various responses to these questions, questions that make up the field of the "theology of religions." Mission has been central to the Anabaptist movement from its beginning in the sixteenth century to its global presence today. This engagement in God’s mission to and for the world continues to be facilitated by and stretched through dialogical missiological thinking and reflection. 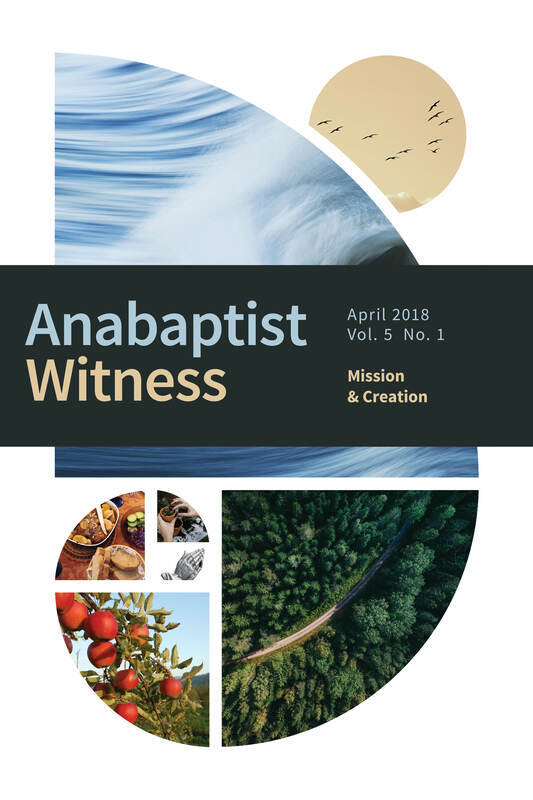 To these ends, we hope the relaunch of the journal Anabaptist Witness, previously known as Mission Focus, will drive the continuous evolution of the field of missiology, providing a place for a global Anabaptist and Mennonite dialogue on key issues facing the church in mission.